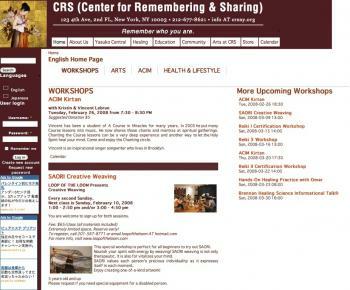 CRS (Center for Remembering & Sharing) is a non-religious, spiritual community center, wherein individuals from all walks of life, including student and professional artists and non-artists alike, can realize their true creative potential. Located just south of Union Square in New York City’s East Village, its doors are open to anyone that needs help that they may discover that they can help others. This mission is based on the principles of A Course in Miracles, and especially on the idea that we are, fundamentally, spiritual and creative beings with limitless power and limitless ways of expressing ourselves and that all of our creations are the expression of universal beauty. In keeping with this mission, CRS (Center for Remembering & Sharing) offers many programs designed to provide people with an opportunity to remember and experience this fundamental truth about themselves. Types of programs include meditation, counseling, mind/body/spirit healing therapies based on A Course in Miracles as well as other kinds of holistic healing practices, art/dance/drama therapies, art technique and composition training, artist residencies, mentoring, artist services, and opportunities to present, perform, exhibit or publish. The Center maintains a gallery space and boutique in its lobby and produces a performance series (contemporary dance, butoh, theatre, video, clown, puppetry. music). In 2006, CRS began producing and publishing a catalog of spiritual books, CDs, and other literature.